Reading Tenkara Fly Fishing Insights & Strategies is like sitting around a campfire and listening to a group of experienced tenkara anglers share some of their tips and tricks. You don't get to ask questions, but then again, you don't get smoke in your eyes, either. Although there are quite a few books on tenkara - in Japanese, this is only the second tenkara book in English. David Dirks has taken a different tack with Tenkara Fly Fishing than Dr. Kevin Kelleher and Misako Ishimura took with tenkara Radically Simple, Ultra Light Fly Fishing. 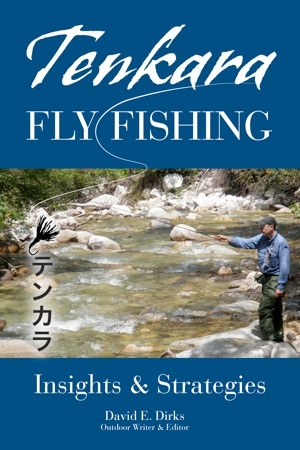 Kelleher and Ishimura's book is an overview of tenkara and fly fishing, while Dirk's book is a compilation of interviews with tenkara anglers. The interviews are not presented one by one, start to finish, but broken up so that it reads more like a panel discussion on various tenkara topics. It's a nice way to lay out the material and makes the book a more interesting read. Like a discussion around a campfire, it covers a lot of different topics but nothing in great depth. It is not a detailed instructional manual. You will pick up some tips and tricks, and you'll quickly realize that not every tenkara angler agrees on every topic. Along with a number of other tenkara anglers and bloggers, I am one of the people who was interviewed for the book. Payment is through PayPal but you don't need to have a PayPal account. You can use your credit card.